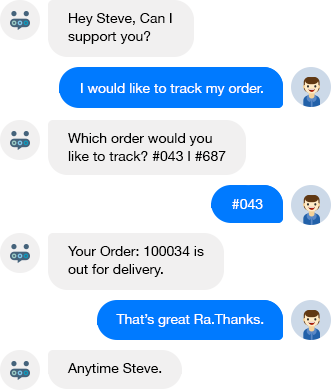 Why do We Call Ra a ‘Well Trained Chatbot’ for eCommerce? Ra – Chatbot for eCommerce Support has been trained to efficiently handle customer queries with 100+ situations that often arise in eCommerce support. While other Chatbots require training in order to handle such queries, Ra is Ready - to -Serve. eCommerce platforms require quick and prompt customer support services, and the LIVE Chat Widget doesn’t always meet these needs effectively. Here, Ra - customer service chatbot, is ready to respond anytime, anywhere without you having to undergo the hassles of training. What Makes Ra – The BEST eCommerce Bot? When your customer or visitor asks a complex question that requires human intervention, then Ra – Chatbot for eCommerce will notify your ‘Customer Support Executive’. And the Customer Support Executive can choose to take over from the Chatbot to answer the query. Ra can help your customers to track their orders and provide them the LIVE status. If in case the order has not reached your customer, Ra can smartly handle your customers and assure them of best services. If your customers wish to change the delivery address or add a new address to their profile, they can ask Ra to do it directly from the Live Chat Widget on the website or from your online marketing channels like Skype, Facebook or Slack. RaCom offers Artificial Intelligence-based LiveChat Software. Too many requests by customers for a purchase invoice? Let Ra come to the rescue. Your customers can ask Ra to get the purchase invoice without any hassle. 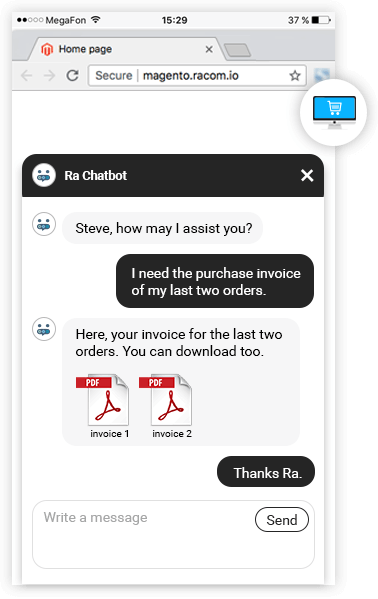 Ra, customer service Chatbot, can support you in generating invoices and avails with the options to download. If your customers wish to talk to the Customer Support Executive, they can ask Ra to 'Contact' them on their specified number. Ra will then notify your Executive about the same. Get your customer support bot now and enhance customer experience. If your customers don’t like the product or have some issues, they can ask Ra to register a complaint or report an issue about the product or the services. Improve your eCommerce support with Chatbot for better customer service. Ra is your customer’s personal assistant, to help customers find exactly what they need right from the chat window. See product categories and browse products faster. Intelligent chat widget, built by Chatbot development company - Marici. Your customers can ask Ra to show the products in a certain category. Ra will bring the best of the products in no time. Ra just makes the shopping experience better for your customers. Customize chatbot for more features in shopping. If your customers want to see items of their Wishlist, Ra can help them to see whenever. All they have to do is ask Ra to show the Wishlist items, and they can easily scan through the items of the Wishlist while in a chat with Ra. If your customers wish to see the Shopping Cart Items? Ra can show them the items in the shopping cart while in the chat. Ra makes it convenient, with the process of checking out directly from the chat window instead of going to the site. Conversational commerce enabled by RaCom. RaCom offers an AI based Chatbot - Ra that offers Click-Button and Typing mechanism in chat communciation, taking conversational commerce to next level. It is compatible with most of the communication channels and can fluently converse in multiple languages. This is your chance to get a Chatbot for your webshop for FREE!